Schistosomiasis (also known as Bilharzia) is a parasitic disease, most common in tropical regions, especially Africa. Schistosomiasis infection occurs through direct contact with contaminated water. Larval forms of the parasite live in certain species of snails and are released into infested lakes and rivers, the larvae can penetrate human skin and migrate to internal organs. There may be no symptoms, or symptoms may not become apparent until months or years later. There is currently no vaccine against schistosomiasis. 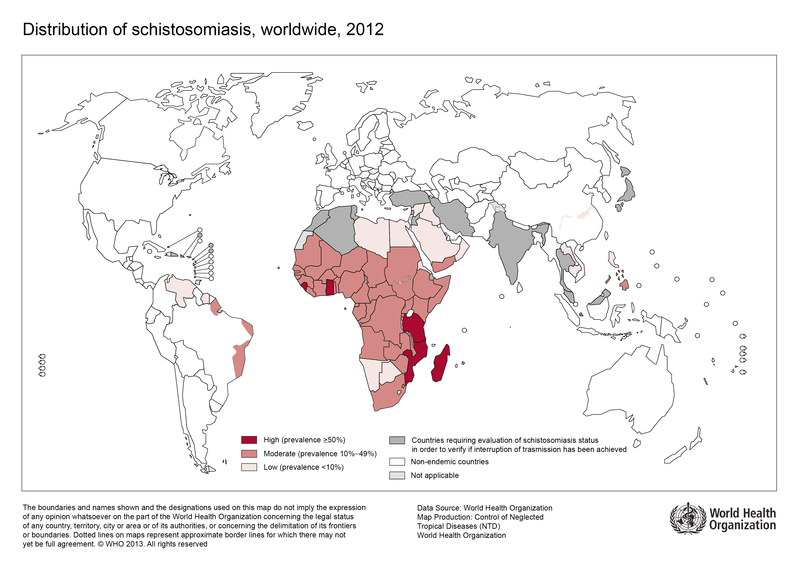 Common travel destinations where schistosomiasis occurs include Egypt, Kenya, Tanzania, South Africa and some areas of Brazil. Many cases diagnosed in the UK result from swimming in Lake Malawi. Travellers should avoid contact with fresh water rivers and lakes in risk areas where possible. Schistosomiasis is diagnosed by testing urine or stool, and blood samples (serology), screening should be carried out several weeks after exposure to fresh water. Schistosomiasis, or bilharzia, is caused by worms (termed flukes) that have a complex life cycle involving freshwater snails. Several species exist, of which the most prevalent are Schistosoma mansoni, Schistosoma japonicum, and Schistosoma haematobium. Left untreated schistosomiasis can cause serious long-term health problems such as intestinal and bladder disease. Schistosomiasis is one of the most widespread of all parasitic infections of humans and the most common parasite transmitted through contact with fresh water. It is endemic (regularly found) in more than 70 low income countries where it occurs in rural areas and the fringes of cities . Over 700 million people globally are at risk of infection, with almost 240 million people infected . The economic effects and health implications of schistosomiasis are extensive. Disease occurs more commonly in children with infection frequently found in those under 14 years in many risk areas [3,4]. An estimated 90 percent or more of those requiring treatment for schistosomiaasis are thought to live in Africa . According to the World Health Organisation (WHO), in 2012, the countries with the highest prevalence of schistosomiasis are Sierra Leone, Ghana, Tanzania, Mozambique and Madagascar. Most of the rest of sub-saharan Africa has moderate prevalence, along with the Philippines, Yemen and some areas of Brazil. In recent decades national control programmes have successfully reduced prevalence of schistosomiasis in many countries, notably Brazil, Cambodia, China, Egypt, Mauritius and Saudi Arabia . Please check our Country Information pages for individual country recommendations. Different species of the parasite occur in different parts of the world and cause different types of disease. Schistosoma mansoni occurs in Africa, the Middle East, the Caribbean, Brazil, Venezuela and Suriname. Schistosoma haematobium occurs in Africa and the Middle East, and Schistosoma japonicum occurs in China, Indonesia, and the Philippines . These three species cause the majority of human disease; Schistosoma haematobium causes urogenital schistosomiasis affecting the bladder, kidneys and genital organs. All other species cause disease of the intestines and sometimes the liver. Other species causing human infection occur in fewer areas of the world: Schistosoma mekongi is found in several districts of Cambodia and the Lao People’s Democratic Republic, while Schistosoma intercalatum and related species are found in the rain forest areas of central Africa . Water development projects, particularly man-made lakes and irrigation schemes, can lead to shifts in snail populations and distribution of risk areas . Population movement such as rural-urban migration and forced displacement has also extended the range of the disease in some areas . Travellers are at risk of schistosomiasis if they wade in, swim or have other contact with fresh water in endemic areas. Although schistosomiasis is found throughout tropical regions, schistosomiasis in travellers is most often acquired in Africa [5,6]. The European Travel Medicine Network (EuroTravNet – a network of clinical experts in tropical and travel medicine) recorded a total of 152 Schistosomiasis cases in travellers in 2010. Most cases were diagnosed in patients returning from Africa, (with Egypt, Ghana, Malawi, Mali and Uganda accounting for 41 percent of cases), and infection was more likely in long-term travellers . For the decade 1997-2008, the GeoSentinel Surveillance Network reported 410 schistosomiasis cases, 83 percent acquired in Africa, the diagnosis was more likely in those traveling for missionary or volunteer work, or as expatriates . The absence of cases in travellers to other endemic areas may be because schistosomiasis is often a focal disease and is not found in locations frequented by travellers to South America and the Far East . A rise in ‘off the beaten track’ trips and adventure travel has contributed to the increase in schistosomiasis in travellers . Outbreaks have occurred in adventure travellers on African river trips as well as expatriate groups. Swimming in Lake Malawi is an important risk factor for travellers . Some water-based activities which may be planned or opportunistic for travellers may carry a high risk of exposure. For example, following some river rafting trips on the Omo River in Ethiopia, most of the participants were diagnosed with schistosomiasis . In 2014 cases of locally-acquired schistosomiasis were reported in France. The point of exposure was identified as the Cavu river in the Mediterranean island of Corsica . This highlighted the potential for the schistosoma parasite to spread into new areas not traditionally associated with schistosomiasis. Schistosoma eggs are excreted in human faeces (S. mansoni and S. japonicum) or urine (S. haematobium). Without adequate sanitation systems, urine and faeces containing parasite eggs may contaminate local water sources. The eggs hatch in fresh water and the larvae, known as miracidia, infect snails. S. mansoni miracidia infect Biomphalaria snails, S. haematobium miracidia require Bulinus snails and S. japonicum prefers Oncomelania species. These snails therefore act as vectors for the disease, with a specificity for each schistosoma species. Another larval stage of the parasite, termed cercariae, emerge from the snails. Cercariae are free swimming and are capable of penetrating the skin of a human. Once they have penetrated skin, the cercariae undergo development and migrate to the liver and then via the venous system to the capillaries of the bowel (S. mansoni and S. japonicum) or bladder (S. haematobium) where mature worms mate and begin to produce eggs. The eggs are then passed into the environment via the faeces or urine and the life cycle begins again . Initial contact with cercariae can cause an itchy, papular rash, known as “swimmers itch.” Once infection has been established, symptoms can occur within 2-3 weeks of exposure, but many infections are asymptomatic (without symptoms). The symptomatic, acute phase of illness is known as Katayama fever and presents with fever, malaise, urticaria (raised itchy skin rash) and eosinophilia (raised level of eosinophil white blood cells) . Other symptoms can include cough, diarrhoea, weight loss, haematuria (blood in urine), headaches, joint and muscle pain, and enlargement of the liver and spleen. Katayama syndrome is due to an allergic reaction to eggs and schistosomula migrating through the body occurring 14-84 days after primary infection, and is frequently misdiagnosed . Chronic (long-term) infection with S. mansoni and S. japonicum causes liver fibrosis (scarring) and portal hypertension (high pressure in liver blood vessels) with ascites (fluid in the abdomen) and oesophageal varices (dilated veins). Long term infection with S.haematobium is associated with bladder scarring, kidney obstruction, chronic urinary infection, and possibly bladder cancer . Neuroschistosomiasis can occur when adult worms aberrantly migrate to the brain or spinal cord, deposition of eggs in the neural tissues leads to complications such as raised intracranial pressure, of myelopathy, and radiculopathy (dysfunction the spinal cord or nerve roots). Symptoms include headache, visual impairment, limb pain and muscle weakness. Travel history is essential in identifying schistosomiasis as a possible diagnosis, and also which species is likely. Detailed inquiry regarding exposure to fresh water will help to estimate the risk of infection. Eosinophilia (increased numbers of eosinophil white blood cells) is also a useful indicator but is not specific . Diagnosis can be made by finding schistosome eggs on microscopic examination of stool or urine. This is the most reliable way of diagnosing schistosomiasis, but requires the adult worms to be producing eggs which may not occur until at least eight weeks after initial infection, when the worms have matured. Diagnosis can also be made by finding eggs on rectal biopsy (sample of tissue from the back passage). Serology (blood tests) detecting antibodies to schistosomal antigens (marker proteins) can allow an earlier diagnosis as seroconversion occurs at eight to 12 weeks [12, 14]. Patients should be referred to an infectious diseases or tropical medicine specialist for treatment. The drug of choice for all species of schistosomiasis is praziquantel . In endemic areas, some countries have opted for a public health programme involving yearly or biennial treatment of local populations at highest risk, especially children . Some expatriates and long term travellers in endemic areas choose to take praziquantel periodically or after leaving an endemic country, however the quality of locally sourced medicines should be taken in to consideration. There is no vaccine available for schistosomiasis and no drug available which prevents infection. Travellers should be advised of the risk of swimming and wading in rivers and lakes or other freshwater contact in endemic countries. This includes popular destinations such as Lake Malawi. Topical application of insect repellent before exposure to water, or towel drying after accidental exposure to schistosomiasis are not reliable in preventing infection. Travellers should also drink safe water (either boiled, filtered or bottled) to prevent infection via contact with mouth or lips. Risk of exposure is higher in still to moderately flowing water where the snail hosts tend to be found, and increases exponentially with length of time in contact with water containing cercariae . Therefore brief contact with fast-flowing water is lower risk. Chlorination kills schistosomes; therefore there should be no risk in well maintained swimming pools. Schistosomiasis cannot be contracted through sea water contact. Cercariae also die after 48 hours in standing water or following heating water to 50°C for five minutes. Filtering water with fine mesh filters may also eliminate the parasite . Schistosomiasis in travellers is commonly asymptomatic (without symptoms). Therefore those who swam or bathed in fresh water in endemic areas may have been exposed to the infection and should be advised to undergo screening tests ideally with an infectious diseases specialist . King C H. Schistosomiasis. In: Guerrant R L, Walker DH and Weller PF, eds. Tropical Infectious Diseases. Principles, Pathogens & Practice. 2nd ed. Elsevier, Philadelphia, 2006: 2: 1341-8. World Health Organization. Schistosomiasis: number of people receiving preventive chemotherapy in 2012. Wkly Epidemiol Rec. 2014, 89, 21–8. [Accessed 10 April 2015]. Colley DG, Bustindury AL, Secor WE et al. Human Schistosomiasis. Lancet 2014;383;2253-64. World Health Organization. Schistomiasis. Fact Sheet No 115. Geneva, February, 2014. [Accessed 10 April 2015]. Gautret P, Cramer JP, Field V et al. Infectious diseases among travellers and migrants in Europe, EuroTravNet 2010. Euro Surveill. 2012;17(26):pii=20205. [Accessed 10 April 2015]. Characteristics of Schistosomiasis in Travelers Reported to the GeoSentinel Surveillance Network 1997–2008. Nicholls DJ, Weld LH, Schwartz E et al. Am J Trop Med Hyg 2008; 79; 5:729-734. Meltzer E, Artom G, Marva E et al. Schistsomiasis among travelers: New Aspects of an Old Disease. Emerg Infect Dis. 2006;12:1696-1700. Moore E, Doherty J. Schistosomiasis among travellers returning from Malawi: a common occurrence. Q J Med 2005;98:69-70. Schwartz E, Kozarsky P, Wilson M et al. Schistosome infection among river rafters on Omo River, Ethiopia. J Trav Med. 2005;12: 3-8. European Centre for Disease Prevention and Control. Rapid Risk Assessment. Local transmission of Schistosoma haematobium in Corsica, France. 16 May 2014. [Accessed 10 April 2015]. Gray DJ, Ross AG, Li Y-S, McManus DP. Diagnosis and management of schistosomiasis. BMJ 2011; 342:2651. .Carod-Artal FJ. Neurological complications of Schistosomia infection. Trans R Soc Trop Med Hyg 2008;102:107-16. Steinmann, Peter et al. Schistosomiasis and water resources development: systematic review, meta-analysis, and estimates of people at risk. The Lancet Infectious Diseases , Volume 6 , Issue 7 , 411-25. US Centers for Disease Control and Prevention. Parasites. Schistosomiasis. Prevention and control. 2012 [Accessed 10 April 2015].